Summer is here, 4th of July weekend (my 3rd favorite holiday) is coming up, and barbecues abound. What better way to celebrate Independence day than with delicious red burgers? I got beets at the farmers market last weekend, and being a big beet lover, I can eat them pretty much anyway. I love them roasted, pickled, in soups, in salads, sauteed, or any other way you could possibly think of! Roasting beets is of course the easiest way to prepare them, but I wanted to do something more exciting! I have a barbeque coming up at work which I will be providing my own burgers for, and as the prepackaged burgers don’t always interest me that much (good in a pinch, but homemade are so much better), I thought I’d make my own. I have a couple of go to black bean burger recipes, but I don’t want to be that girl, you know, the one who always eats the same food. I saw this recipe on The Kitchn and thought maybe I could do something similar. I tweaked the recipe a bit, making it a bit more robust by adding some wheat gluten and bread crumbs, and changing the rice to barley to get that deliciously chewy barley texture in my burger. I also wanted my burger to have a bit of a kick, so I changed the spices some. The result had a deliciously rich set of flavors: the slight sweetness of the beets, the tanginess of lemon juice, the richness of roasted peppers in chili powder… And the texture was great. Not only did the burger hold together really well from the gluten, but each bite had the softness of the beans, the chewiness of barley, and the slight crunch of the beets. I ate mine on a toasted bun with melted pepperjack cheese (this is where I admit that I’m not a vegan, though a vegan cheese could definitely be substituted quite easily) and hot sauce with a side of corn on the cob. The burgers would be equally good with tomatoes, lettuce, pickles, or whatever your favorite burger toppings are! 1. Rinse the barley with water, and check for any small stones or pieces that might have been missed during processing. Put rinsed barley in a small pot, and cover with one cup of water, adding a 1/2 tsp of salt to the pot. Bring to a boil, then immediately reduce heat to just above the lowest setting. Let simmer for 40-50 minutes, until the barley is soft and chewy. 2. Meanwhile, heat a couple tsp of olive oil on a skillet over medium heat. Saute the chopped onions and cook until translucent, about 5 minutes. Add the beets, stir, and cover until the beets are cooked through, about 15 minutes (depending on the size of your dice), stirring occasionally. 3. When the beets are soft, uncover the pan, stir in the garlic and cook for an additional couple of minutes. Remove from heat. 4. In a large mixing bowl, mash the beans, and stir in the cooked barley, beet and onion mixture, parsley, thyme, chili powder and lemon juice. Salt and pepper to taste. 5. Add the bread crumbs and mix together until incorporated. 6. Add the vital wheat gluten, 1 tbsp at a time until the mixture begins to clump together. A patty should hold together without sticking too much to your hands (a little bit will inevitably stick). 7. Using a 1/4 cup measure, scoop a generous portion of the mixture and flatten between your palms. 8. These burgers may be panfried or grilled. Preheat a skillet to a medium high heat, or heat up the grill. Spray with cooking oil. Once hot cook the burgers, about 5 minutes on each side. Note: If you don’t have vital wheat gluten, substitute whole wheat flour. Extra burgers can be stored in the fridge for a week, or frozen, but defrost before cooking. This entry was posted in entree and tagged barbeque, barley, beets, black beans, food, grill, recipe, vegan, veggie burger. Bookmark the permalink. 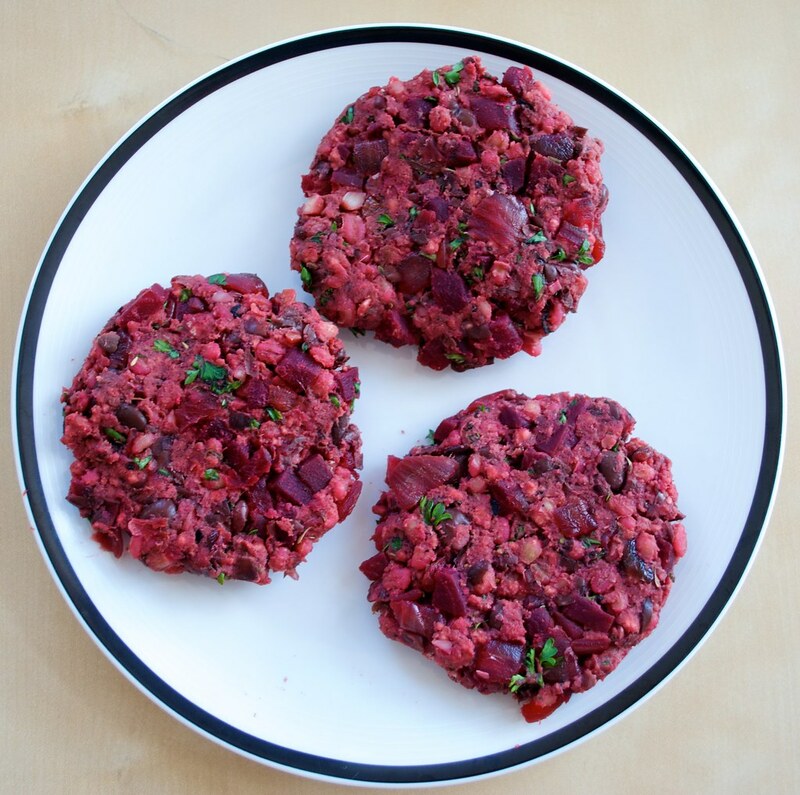 This beet burger looks so amazing. I can “feel” and “taste” the flavors of the sweet beet and the rich texture of the barley just by looking at your superb pictures. This recipe will definitely be on my list – alas after the 4th of July since I will be in mid-air between Europe and Asia on that day. THe color of these is very cool! They look healthy and delicious!! What a cool way to use beets! I can’t wait to try these! Too too good….and too too easy. Wow! These look wonderful. I’m always searching for a great veggie burger! So glad I’ve discovered your delicious blog. “the richness of roasted peppers in chili powder”..this is in the description but not in the ingredients…have I missed something somewhere? Eilidh, the chili peppers in the generic chili powder you buy at the store are roasted. If you buy chili powder at, for example, an Indian specialty store the peppers are not roasted and as a result the chili powder is spicy, like cayenne powder. The roasted chili flavor of the chili powder is what I was referring to, there are no fresh peppers in the recipe. Hope this helps clear things up! what a creative cook you are! come be my personal chef? 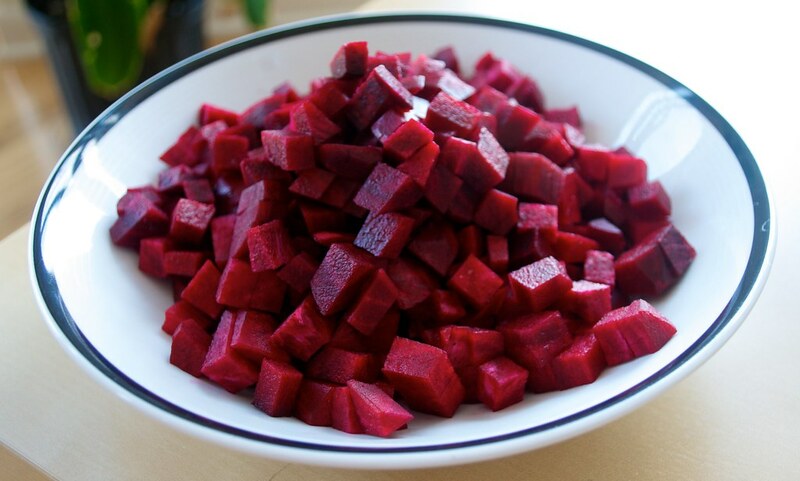 what i do, is i grate the beet, mash a potato diced onions , then of add whatever spice i can lay my hands on, salt, make patties out of this of course sometimes i serve it with bread, sometimes just like that.